Ted Cruz to Donald Trump: "Leave Heidi the Hell Alone"
Ted Cruz on Thursday fired back at Donald Trump's personal attacks on his wife, Heidi Cruz, calling his opponent in the GOP presidential race a "sniveling coward." "I don't get angry often, but you mess with my wife, you mess with my kids, that'll do it every time," Cruz told reporters in Wisconsin. "Donald, you're a sniveling coward, and leave Heidi the hell alone." The Texas senator's warning came hours after Trump escalated his attacks against Heidi Cruz, which began with a tweet by Trump on Tuesday night that threatened to "spill the beans" about her. The billionaire had taken issue with an ad by an anti-Trump super PAC that featured a risqué photo of Trump's wife, former model Melania Trump, while urging Utahns to support Cruz. Cruz quickly responded with his own tweet Tuesday night, telling Trump: "Pic of your wife not from us. Donald, if you try to attack Heidi, you're more of a coward than I thought. #classless." Cruz disavowed the ad Wednesday, calling it "completely inappropriate" and insisting his campaign had nothing do with it. "If Donald wants to get in a character fight, he's better off sticking with me, because Heidi is way out of his league," Cruz said during an appearance on CNN, borrowing a line from the movie "The American President." Later Wednesday, however, Trump upped the ante, sharing on Twitter a photo that shows Melania Trump alongside an unflattering picture of Heidi Cruz. A caption on the photo says: "No Need To 'Spill The Beans.' The Images Are Worth A Thousand Words." 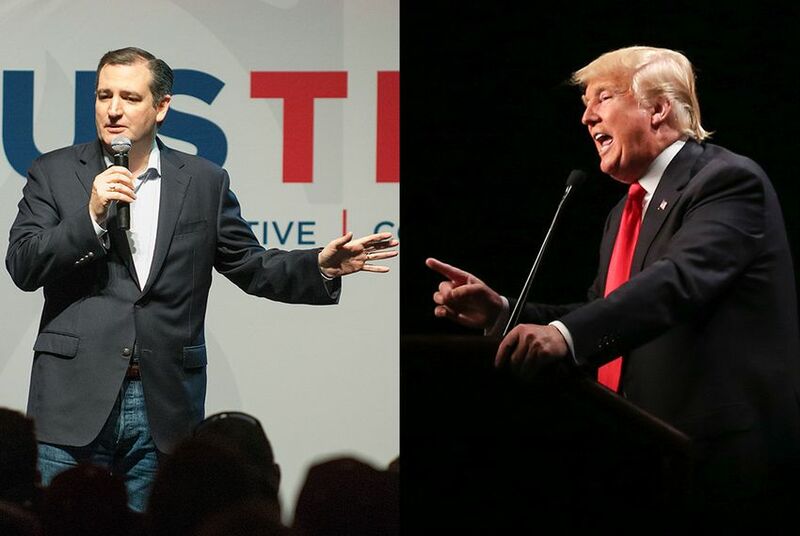 Cruz again issued a rapid response on Twitter, telling Trump: "Donald, real men don't attack women. Your wife is lovely, and Heidi is the love of my life." The senator elaborated Thursday afternoon before a campaign stop in Dane, Wisconsin, suggesting Trump is scared of "strong women" like Heidi Cruz. "Real men don't try to bully women," Cruz said. "That's not an action of strength. That's an action of weakness. It's an action of fear. It's an action of a small and petty man who is intimidated by strong women." Asked whether he still plans to support Trump if the billionaire wins the Republican nomination, Cruz only said, "I'm going to beat him for the nomination." Pressed on the question, Cruz continued to repeat Trump will not be the nominee. Heidi Cruz herself, campaigning Wednesday in Wisconsin, responded to Trump's original tweet threatening to "spill the beans." "Well, as you probably know by now, most of the things, many of the things others say are not based in reality," she told reporters. After Heidi Cruz introduced her husband at a rally Thursday evening in Janesville, Wisconsin, he acknowledged she "has been in the news the past couple days." "Let me just say: She is the most beautiful, extraordinary, generous, loving, amazing, fantastic woman on the face of the planet," Ted Cruz said. "She is my best friend in the entire world. I admire her. I adore her. She is an unbelievable, loving, caring, laughing, fun mom to Caroline and Catherine, who look up at their mommy with unlimited respect and joy." The senator then turned to his wife. "Sweetheart, I love you with every ounce in my heart," he said. Dave Weigel of The Washington Post contributed reporting.